Where I am in the world the seasons are stuck between autumn and winter. So, Wutumn. An awkward transition where the weather seems just as confused as we are. It seems even trees experience the same fashion dilemma as to what to wear at this time or rather what leaves to drop. Even TV adverts have got their months muddled up with new Instagram filtered Christmas ads coming too early that for me the truth of it all seems hidden under a pile of Frozen wrapping paper and M&S food. I have been thinking a lot. Yeh over-thinking is my thing. Of what to write. I have everything and nothing to write about but, I was getting anxious (spoiler there). And as they do all those mean bean thoughts bunched together and formed a mob against me in my mind. Alone I hosted a pity party where I just drowned in these thoughts. Let the guilt build and build to the point when it too became fuel for the nasty negatives. So, today I went for a walk. The same usual walk I take. Nothing too adventurous. To what all we humans seek to do: which is to find inspiration. So, as I took my jumpy jumpy dog around a small path, I saw a golden leaf (one of the few left) rocking like a cradle side to side before it hit the ground. You say it’s just a leaf. I know and I will get to that in a minute. Something struck me about it but, before I could tap it into my iPhone notes my dog decided it needed the loo. Not the best timing, but still I remembered it. Not that you really wanted to know the whole loo situation of course, sorry! Well as I looked at this blank screen I began to think. Again with the thinking. 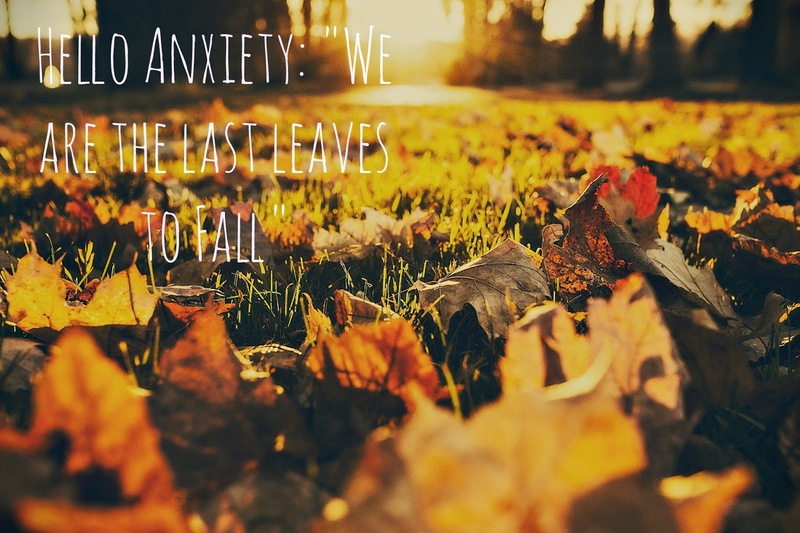 We are the last leaves to fall – off the tree. Fall in this metaphor does not mean death, but that does not mean that we can’t believe it to be. See it as this instead. We are the leaves on the tree. Use your imagination here (imagining bugs life) – it can be any tree you want as long as it has leaves. Instead of the fall being death think of it as an opportunity. But, with all opportunities there is the unknown. So, we wait watch the other leaves fall before us time and time again. We cling on and on until the tree finally forces us off. What is the moral here? Well for me it is this. We who get anxious more than others like not just to wait, but sometimes to hide until it is the inevitable. Where there is no longer a dark corner to sneak into or a door to run out of. We are scared of falling. Likely have visualised all the horrible things, every eventuality other than happy ones like a dramatic film trailer in our heads. But, what if we didn’t consider it as falling but flying. Floating through the air has got to be a metaphor for happiness, right? For that leaf I saw had a gentle landing. Perhaps we need to fall in order to pursue are dreams. Although to us fear can mean different things if not an overgeneralised everything. We fear change the most. That is natural. But, we can’t control it. Just like how the tree or the leaf has to change with the seasons or adapt with the climate. Like the protagonist in a story there is always a realisation of something. It is time for us to float in the air, after all no-one likes being the last one to fall. It’s pretty lonely. Trust me I know. If you liked today’s post or think it might help someone else please give it a sharey. I have a new instagram account which is _hello_anxiety. I will be posting frequent inspirational quotes to get us all in the mood and changing those anxiety driven minds of ours. Hope your day has been swell and anxiety free. If not so great here is a virtual hug ( ) and well done for getting through it!